Hooray, ’tis the season to be Jolly.. so many wonderful celebrations in Autumn/ Winter from Thanks Giving, to Halloween, to Christmas and the ending in News Year Eve! 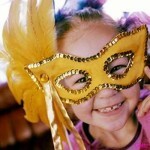 These are all occasions that are wonderful for establishing family traditions and easy kids crafts for family or kids. 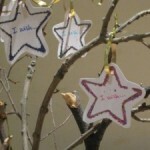 To the task at hand: New Year’s Eve Crafts! YAY! 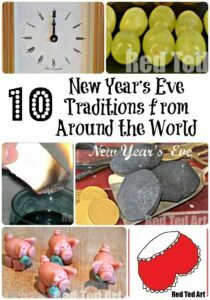 I also have a set of New Year’s Eve Traditions from around the world for you, do go and have a peak! 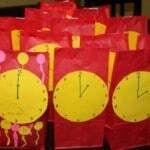 As well as an HOUR BY HOUR set of Countdown Activities to do with kids. 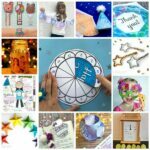 Each hour gives you 2-4 ideas of what to do.. there are many free printables as well as non printable activities and crafts. Why not check it out? The best bit..? It comes with a countdown clock.. you can move the clock along hourly or half hourly if the kids need to get to bed earlier! 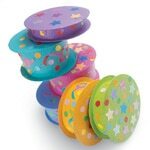 I HAVE to start with this post from Pioneer Party & Gift, as it has no less than 14 kids New Year’s Eve party games. Definitely one to keep the kids busy with. Similarly, here is a set of activities and ideas from SWeet Blessings. Not only did she have 12 different activities and goodies planned out, but she invented her own riddle for each one, so the kids would have to figure out what the treat or activity is first. Brilliant. I am not much of one for “New Year’s Resolutions” – they usually just end up making people feel bad. But I do LOVE the idea of a wishing try.. how wonderful to wish for things in the New Year, it kind of makes it all sparkly and magical. No Time For Flashcards comes up trumps with this activity. These countdown clocks are super duper easy to make and OH SO FUN!!!!! 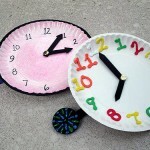 The kids can colour and customise their clock and then get ready to count down. 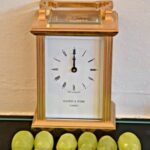 Start at Noon.. to midnight.. or write your time stampes – maybe from 6pm to 9pm!! 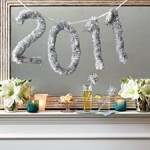 Martha Stewart has these oh so stylish shimmer streamers that have something very New Year’s Eve Craft about them. Maybe the represent the bubbles in your bubbly or the sparks of fire works or the stars in the New Year’s Eve sky, but to me they have New Year’s Eve all over it! 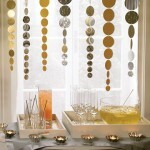 Another Martha Stewart idea (whilst we are there already!) 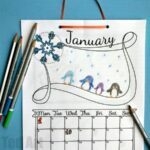 for New Year’s Eve decorating crafts is this simple Tinsel Banner. 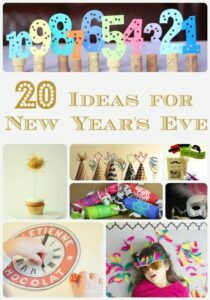 A great way to use anything up from Christmas crafts or school plays and sure to get you into that New Year’s Eve mood! 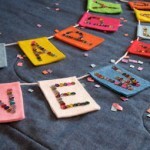 Or check out this colourful Garland from Craft Kaboose. 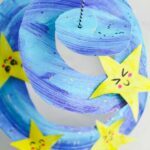 An opportunity to use up lots of colourful bits and pieces and make this New Year’s Eve Craft really bright and jolly! 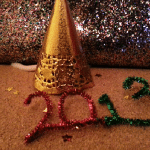 Learn how to make New Year’s Eve Thaumatropes! 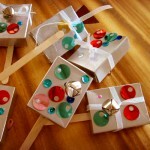 I love these little Raising Box shakers that Craft Ideas for Kids came up with as a New Year’s Eve Crafts idea. The little bell in particularly makes me happy! Yes, this one time of the year when we encourage our kids to GET NOISE! 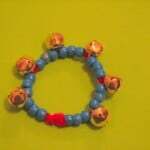 Love this simple paper bowl and bead noise maker from Education. 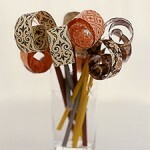 Another cute and upcycled New Year’s Eve Crafts idea are these noisemakers made from old ribbon spools. Family Fun shares their how to. Martha Stewart shows us how to make these BEAUTIFUL paper blowers… never really thought about the fact that we could make these ourselves! Wonderful. 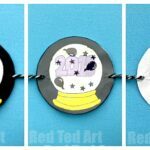 Another cute New Year’s Eve crafts idea from Martha Stewart is this button noisemaker… and it looks like it isn’t *too* noise. Yay. Super simple, super cute. My two would LOVE this idea from Ramblings of a Crazy Woman! 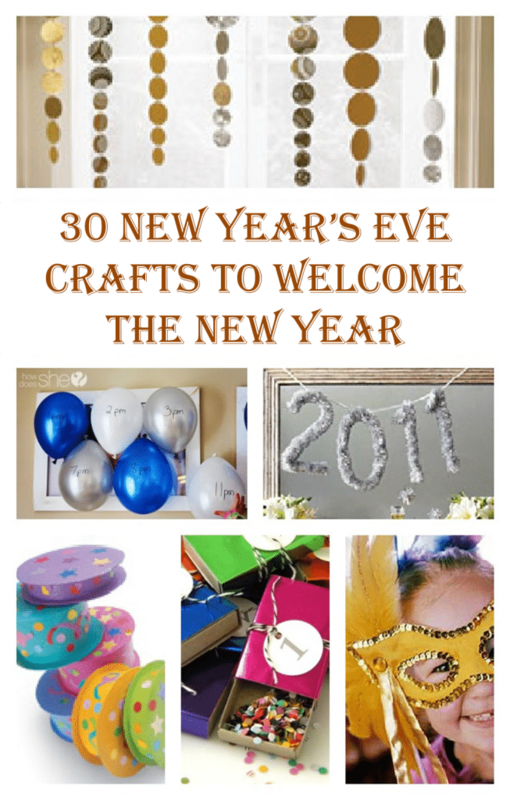 Here a simple and cute New Year’s Eve Crafts Idea! 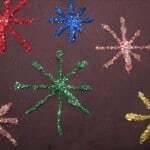 Glitter fireworks from The Ramblings of A Crazy Woman. 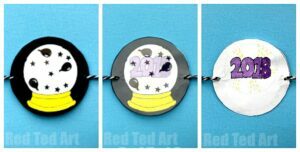 Sometimes keeping things easy and simple is best and is a lovely way to sit down and still do a “topical” craft with your kids! How pretty is this Firework Town (originally made for the UK Bonfire Night, but just as appropriate for New Year’s Eve, surely?!). A team effort from Patches of Puddles. Love it. 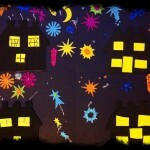 Or rather sweet is this spin art fireworks from The Imagination Tree. Always a great activity for the younger children amongst us and certainly no big bangs to frighten them! Can’t have real fireworks? 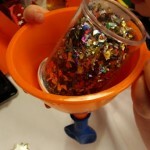 Fear not, this New Year’s Eve science craft will have your kids oohing and aahing: Fireworks in a Glass from Science Sparks. 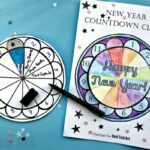 A fun little craft helping focus on the “big count down” and whlist you are it, you can sneak a little “how to read clock teaching”. Craft Kaboose shares this craft. Mmmh, yes confetti is messy, but SOOOO pretty and fun! 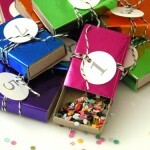 Love Carolyns Homework idea of making your own confetti and decorating matchbox. Wonderful. 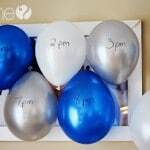 Sun Hats and Wellieboots (a gorgeous blog by the way, do check it out if you don’t know it already) has wonderful Confetti Balloons to pop as the clock strikes 12. 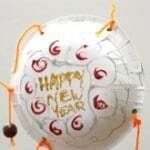 Great fun to make and build up that excitement to the New Year! 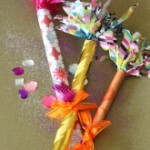 Or if you don’t fancy the balloons (and the bangs that go with them), how about some adorably fun and sparkly confetti wands? How Pip Squeak would ADORE these. Shared by Education.com. 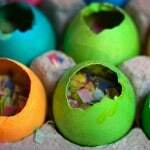 I have loved these confetti eggs from Playing By The Book for a long time now. 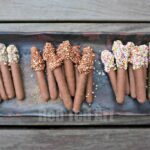 She actually made them as a traditional craft for Easter Sunday, but would also be a perfect fit for any confetti crafts and activities this New Year’s Eve. Take a look and have fun! Cute little Marzipan Pigs are part of New Year’s Day traditions – hand them to neighbours and friends for good luck. 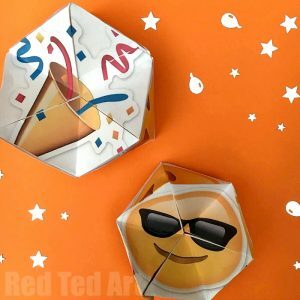 “Making” these is a great activity for that loooong wait on New Year’s Eve. 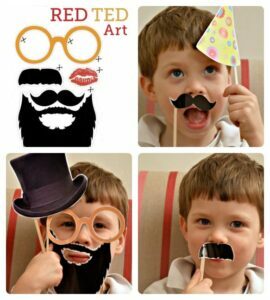 Love these DIY Photo Props – a great New Year’s Eve Crafts for kids -just get the kids to print these photo props, cut them out, stick to craft sticks and then have lots of fun creating New Year’s Eve Memories! 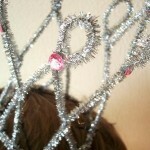 And another cute idea, use pipe cleaners to make adorable little tiaras. 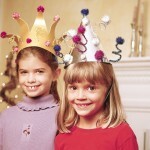 Wonderful for any New Year’s Eve (or Princess) party. How to on WhiMSy Love. These are so cute and fun. Love the bright colourful felt used and the funny faces. 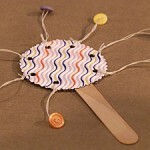 Check out the “howto” by Sunny Coast Kids! 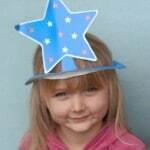 Love this selection of paper plat party hats that you can find over Alphamom. Though none of them are specifically for New Year’s Eve hats, I do think they are a great idea – and the star one definitely would work. Add a cheeky “year date” and you are done. 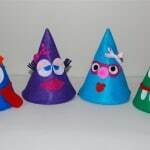 I also thought that these party hats were cute – I know my kids would love the idea of “havinf a basic hat” and then being allowed to decorate it to their heart’s content. These are from Spoonful. More hats from the wonderful Domestic Goddesque! Complete with funky “specs”. 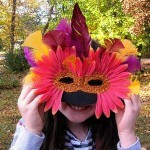 Craft Jr shares a template and instructions of how to make this wonderfully colourful masquerade mask. Fabulous. 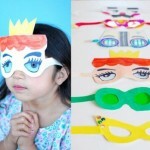 Would you have guessed that this mask was based on a paper plate? I didn’t! Parents Connect share this lovely idea. 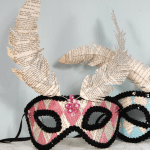 Or how about these stylish “book pages” mask from Mark Montano? Or how about these? I think they are brilliant! A wonderful craft from Bloesem Kids. 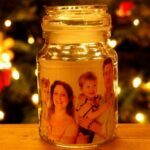 Spotted on Kelli Crowe‘s blog, we made a time capsule last New Year’s Eve – a lovely way to discuss the year gone by and add a precious family photo or two! A similar activity 0- but really something to focus on throughout the year is this wonderful ideas from I Can Teach My Child. You have to read the whole post for it’s full impact, but it is a wonderful way to recognise the wonderful and good things in your lives. Oh and here.. are some reasons why I do NOT do New Year’s Resolutions!!! 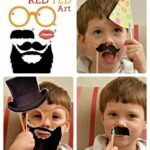 UPDATE: and new this year.. great fun New Year’s Eve photo props too! Yes yes.. I know.. they are just “food for thought” for you to tuck away until later! 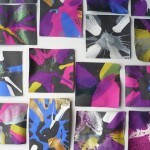 Lovely round up Maggy, and thanks for featuring our firework. Thanks for including me in this round up. New Year’s Eve is a massive thing in the Netherlands – fireworks galore and lots of mischief too. Perhaps the biggest celebration of the year (apart from Queen’s Day). My pleasure and ooh I like the sound of mischief! I didn’t know it was bigger than any of the other celebrations. Wow! lovely round up as always! 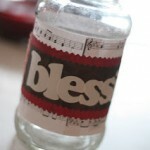 I agree, the blessings jar rather got me too!